BHM Snap-in allows monitoring multiple BizTalk environments from a single MMC. When you register BHM on a BizTalk server, by default it will add a “group” node representing the current BizTalk group configured for this server. You can, however, add additional nodes corresponding to different BizTalk groups by specifying its name, the location of its Management database and the output folder. Each group node will have its own customized settings in term of its level of information to collect, its level of information to display, its type of notifications to enable, or its type of performance data to collect. Once a group node is added in the BHM hierarchy, you can start immediately to analyze its corresponding BizTalk group by right-clicking on the node and select the “Analyze now” menu item. The analysis consists of running a number of queries to collect all important information about the BizTalk group, evaluating a set of rules for each of them, and raising any warnings (critical or not). Note: The engine, the queries, and rules repository are the same as used by MBV. You need to run the BHM in the BizTalk Server at least once before configuring BHM in BizTalk360. Once BHM is installed in the server where BizTalk360 is running, the administrator needs to configure the integration with BizTalk360. You need to run the BHM from BizTalk360 under "BizTalk Health Monitor (Reports)" section once you have configured BHM in the Settings screen. In addition to scheduled execution of BHM, BizTalk360 allows you to run BHM whenever they want to get the information on the status of the environment. 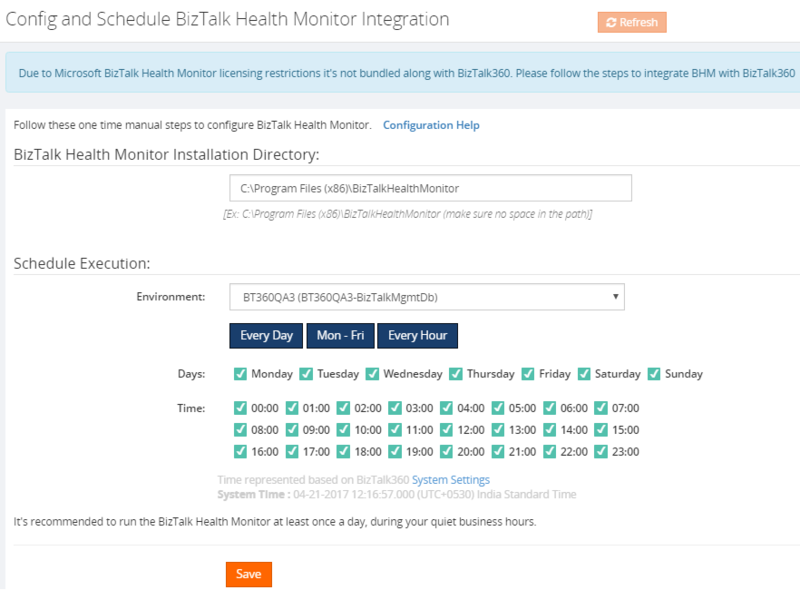 When the 'Run BHM Now' button is clicked, the BizTalk Health Monitor will be scheduled to run in the next cycle (which is usually within the next 60 seconds since the BHM Schedule monitoring service is scheduled to run every 1 minute). BizTalk360 will display a message as BizTalk Health Monitor is scheduled to run in next cycle, normally within a minute or so. Check back after some time. Depending on the time taken to retrieve the result from BHM, the results will be made available in BizTalk360 within a minute or few minutes. After few minutes, you can click the Refresh button to view the results in the drop down. Click the expand button against 'Health Check Tools' tab and select 'BizTalk Health Monitor' link. The example shows you to view BHM Reports (critical errors, non-critical errors, header information, summary report. You can select the report from the drop-down and click the export excel button to download the BHM Report. BizTalk360 integrates with BHM to provide administrators the ability to monitor the amount of critical and non-critical errors identified in the report. As an administrator, you can set alerts to be notified when the BizTalk Health Monitor reports critical/non-critical errors exceed a specific value, say 5 and 10 respectively. BizTalk360 can trigger a notification to your preferred communication channel (SMS, Email or any other configured notification channels) when there is a threshold violation. This issue mainly happens on a 64-bit machine. When you accept the EULA displayed by BHM, it writes the acceptance setting in the 64-bit registry hive. But BizTalk360 is 32-bit due to restrictions imposed by dependency objects like ExplorerOM, hence it always looks at the 32-bit hive (WoW64 in a 64-bit machine). To fix this issue, please create following entry in the registry. You can either create the above Key's manually by opening regedit.exe ("Run as Administrator") or download this file .reg file and then double-click to import.